Andrew Roraback, right, with Sen. L. Scott Frantz while Roraback was a senator. The administration of Gov. Dannel P. Malloy is playing an inside game trying to win Republican support for the confirmation next week of Justice Andrew J. McDonald as chief justice of the Supreme Court, signaling a willingness to nominate a former Republican senator, Judge Andrew W. Roraback, to succeed McDonald as an associate justice on the state’s highest court. The possibility of Roraback’s nomination was first reported by Hearst Connecticut Media and independently confirmed by CT Mirror. Roraback is now a trial judge, one of three former legislators, two Democrats and a Republican, the governor appointed to the Superior Court in January 2013, months after he lost a congressional race. Senate Republican leader Len Fasano of North Haven said Thursday the confirmation of McDonald, who would be the first openly gay chief justice, will be made independently of Roraback’s chances for professional advancement. Roraback is a graduate of Yale and the University of Virginia School of Law. House members watched the tally as votes are cast largely along party lines on McDonald’s nomination. The governor has tried to lower the temperature of the campaign to win confirmation for McDonald, his friend and former chief legal adviser, while members of the Connecticut bar and others have written and called senators urging their support for McDonald. Republicans have said they bitterly resent TV ads suggesting homophobia was a factor in questioning McDonald’s confirmation. The governor’s communications director, Kelly Donnelly, would not confirm Roraback’s possible nomination, but issued a statement that did nothing to suggest it would not happen should McDonald be promoted. The gambit involving Roraback may be too late and too public. It is not unusual for governors and legislative leaders to talk about judicial nominations, casually linking one to another. But those talks typically occur before a nomination, not after it has seemed to stall. “I don’t think this type of a deal can work,” said John P. McKinney, a former Republican state senator close to both Fasano and Roraback. The senators have spent weeks studying McDonald’s decisions and are unlikely to flip based on seeing Roraback go on the Supreme Court, he said. But he added that most senators are publicly undecided on McDonald, giving them room to maneuver. McDonald, a former Democratic senator who was co-chair of the Judiciary Committee, was confirmed without controversy five years ago as an associate justice of the Supreme Court, but his promotion has become the mostly highly politicized confirmation battle ever seen in Connecticut, featuring television commercials by supporters and a telephone and letter-writing campaign. If confirmed, McDonald would succeed Chase T. Rogers as chief justice, creating the vacancy for an associate justice that Malloy is ready to give to Roraback. If the confirmation is blocked, Malloy would have to find another nominee for chief justice, a spot unlikely to go to a former Republican senator. McDonald’s promotion was confirmed in the House by a single vote, 75-74. Only one Republican voted for confirmation; five Democrats joined the GOP in opposition. With the recusal of a Democrat in the evenly divided Senate, Republicans have an effective 18-17 majority on McDonald’s confirmation. Confirmation requires approval by both chambers. Fasano has said he is leaning against confirmation, but insists there is no caucus position. 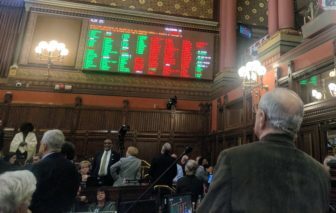 House Republicans focused their opposition on McDonald’s participation in a 4-3 decision that struck down the last vestiges of capital punishment in Connecticut. The decision spared the lives of 11 men on death row, including a duo convicted of killing the wife and daughters of William A. Petit, who is now a Republican member of the House. On Thursday, former Judge Anne C. Dranginis, who was appointed a trial judge by a Democratic governor and an appellate judge by a Republican, and three other lawyers said the Connecticut Bar and the faculties of the law schools at Yale, UConn and Quinnipiac are making final pitches urging members of the evenly divided Senate to confirm McDonald. Leslie C. Levin, a law professor at UConn, said McDonald followed judicial canons in participating in the case.